I am not sure why would the owner of a bargain store gets sandals with crosses on them on purpose and ruin his business. He probably did not pay much attention to his merchandise. I hope that people will calm down and realize they are taking things way out of proportion. As it’s said in Lebanon, “el-ossa mish rimmeneh bass 2loob milyeheh”. 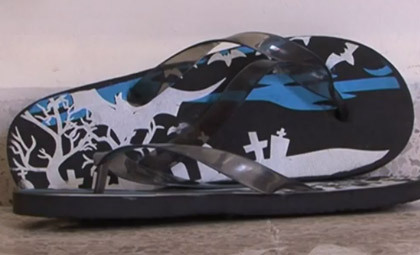 The “spooky” sandal shows something like a tombstone rather than an actual cross. While not justifying it, things wouldn’t have went out of proportion had some events with religious ramifications been dealt with promptly and correctly (Lassa, purchasing of lands, prohibition of selling liquor). 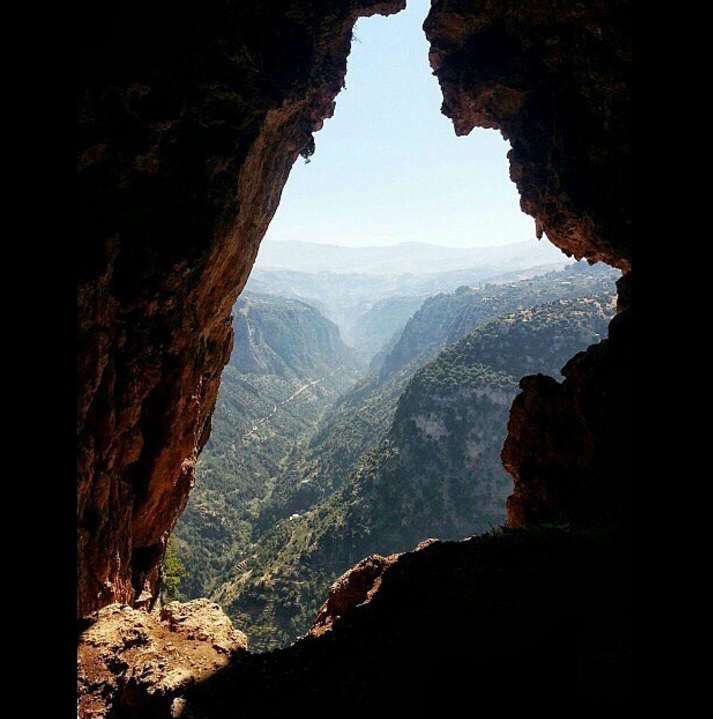 Christians feel that their existence in Lebanon is threatened. It’s a natural reaction. That’s what everybody would do, no matter what religion they belong to. There’s a cause and effect to everything. The best, long-lasting solution is to address the cause not the effect. @nadine Why? is it war time again and we should get ready? I agree with Najib, people are taking this way out of proportion. And it does look more like the person who designed it didn’t go for the “Anti-Christianity” look, instead he wanted it to look like a grave yard… and it does( as portrayed in “The Adams Family” 😛 ), but still the guy who bought the merchandise and selling it should know better than to sell this stuff HERE in LEBANON! We don’t need more excuses to point fingers and fight. so you are saying that if a particular religious population does something unethical and stupid, all other religious sects automatically have the right to do such things in the name of waking up for a change? That is exactly the mindset that has been causing so much tension in Lebanon for the past 70 years or so. lebanese media are IDIOTS and are blowing this out of proportion and describing it as if hizbullah are taking over lebanon ( based on nowlebanon video),in reality its cheap fliplops designed as a grave yard which happen to have a cross on them and the business man was trying to do a good deal in selling those for 2000ll !! i bet in china everyone is wearing those cheap flipflops and nobody noticed that there is a small cross on them, but as usual in lebanon its always about fanatism and fetneh thats why this country will always be a RETARD COUNTRY !!! the reporter who did the article should go to jail for trying to instigate a fitneh !! Something I don’t understand: If the owner, Ali Fakih did on purpose, than yes he deserves punishment. But,It’s a bargain store, do you really think that the owner did that intentionally. People like Fakih go to china.. get as much stuff their money could buy and come sell it in Lebanon. They do not even look at the products they are buying, it’s all about getting a good wholesale bargain and filling the shelves. i am a dedicated christian. and this didn’t offend me at all. come on it’s just a graveyard. this act is beyond stupid. lebanese people (all religions included) are becoming way too sensitive. 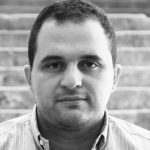 The fact that religious people are so insecure about their symbols only tells one thing: Religion is not the self evident truth everyone claims it is..
once they did a charicature on LBC of Hassan Nassrallah and all hell broke loose in Achrafieh … and you want people to take it easy when they see a cross on a flipflop? come on Najib how can you make this thing look as simple? FYI Lebanese are the most sectarian of all! They think they are the centre of universe. It is in the water. Once you remove a Lebanese out of the country you will see a sea of change in them. I think you are all victims of something THE MEDIA has created and wanted. They wouldn’t talk about it if they didn’t think this will lead to disputes/arguments/controversies/etc…(You name it!) I’ve previously seen the cross on thongs and no one said or did anything about it. It could be handled in a much better way other than ranting and complaining. Do not get me wrong, I appreciate all those who are sticking up for Christianity (This shows there is still faith in the Lebanese hearts), but if you really find it offensive and you want to take action, then perhaps you should suit the manufacture that made those flip flops… they are just as guilty as this guy is if not even more. HOWEVER, I repeat you are falling for something the media wants… the worse this gets the more work they will get. What does the guys religion have anything to do with this btw? Why does NowLebanon say “Ali Fakih, a Shia Muslim” instead of just “Ali Fakih, the shop owner”? Are Christians offended because a Shia is selling these sandals? No they’re not, they’re offended because the sandals had a cross/graveyard on them and they have a problem with that. NowLebanon is enticing strife by turning it into a Christian vs Shia issue and I believe in situations like this the government should step in and take action again the publication with a large fine or warning. It’s so wrong and juvenile to bring up the topic of the Ashrafieh demonstrations. It isn’t a healthy way of thinking. If others almost burnt down a town in the past, it doesn’t mean it was the right thing to do. If we continue reacting and behaving this way, we have zero chance of becoming a developped nation. I think religion should be banned in Lebanon. just saying. at least until Lebanese are educated and mature enough to handle multiple gods symbols and beliefs. this reaction is what a typical third world country would do. you should have seen the guy giving the speech in front of the shop after it was closed. that was EPIC. wat intrigued me the most out of this whole flip flop controversy is the amount of comments this article had. if only u looked at it from a non religious, non political, non lebanese aspect u might have laughed it off and clicked on another article to read and continue with ur normal life as if nothing happened. ma bedda hal2ad. ya jamei3a yilli bi libnien, khalassna ba2a 7arakeit. if u want a war khalsoona and do it. we want to feel like we want to come back to our counrty but all that is happening makes us think “wat for” since such a simple mistake of a flip flop made such anger and hostility rise among the new generation. so plz just “flip or flop” but move ahead. What would have happen, if it was a mosque instead of a cross? This store owner should be judged the same way Christians and non-muslim for things with less harm than this one. I don’t care what certain Muslim extremists did in Achrafieh when the Danish cartoons came out in the papers. If they react in a barbaric way, should Christians do the same because of sandals? Simply report this to the authorities if you feel offended and let justice take its course. I am quite sure many Christians bought those flip flops without noticing and I am almost certain the shop owner didnt even pay attention to this. If some Christians felt the cross was insulted, I suggest they take a tour around Batroun night clubs at night and see those wearing huge crosses and drinking and cursing and engaging into fights and getting f*cked up. I see those more insulting to the cross rather than some sandals. @Mark you might be right, but i also think there might be a chance that lebanese protested about the sandals exaclty because the owner is not christian! and i think that if he was, this issue wouldn’t have taken the same propaganda it did now. and even maybe no incident would have happened at all! i think that’s how much lebanese people became sensitive and close minded. i know it’s sick, but i think it’s true. I guess we will know in 2 months time Alex. It’s gonna be very interesting.